The artificial roots made in the form of screws are called dental implants which are used to restore the lost teeth. This helps in preventing loss of jaw bone. It is the artificial replacement of natural root with dental implants and this treatment is categorized as prosthetic dentistry which may also be considered as a cosmetic dentistry. Those who have lost their teeth feel least comfortable smiling in public moreover, chewing and biting becomes difficult. With help of replacing missing roots with dental implants, patients’ regain their strength to chew all type of food. Other than providing strength to chew food it helps in maintaining the shape of the jaw bone and supports the facial features and prevents from any further loss. If you have lost your tooth due to any of the reason and want to regain the lost tooth then dental implants can be one of the possible ways. But to know if dental implants are the right treatment for you, you need to consult a dentist. The dentist will thoroughly examine your gums and teeth and check the bone density. To see if there are sufficient bones in your jaw that could support the dental implant, to determine the bone structure the dentist might do some x-rays or CT scans. After evaluating the overall oral condition he will advise you the possible medical treatment. The type of dental implant to be used in the treatment depends upon how your bone structure is. Based on the condition the dentist will inform you how long the whole treatment procedure will take. Along with this, he would also explain how many appointments will be required and what he will be doing in each of the advised appointment. Any other oral issues have to be resolved before starting on to the dental implant. Your dentist will advise you some treatment to cure the gum disease or any other oral health issues. You might be asked to quit smoking, as it can cause complications in the implant procedure. Once the dentist is ensured that other issues are resolved, he will start on with the actual procedure. The procedure of implant is usually completed within a day appointment. But the Osseo-integration might take time; it is a process in which the implant is affixed to the jaw bone. It might take around 3 to 6 months to fix and heal the gums and after its healed the dentist places a crown over the screw. 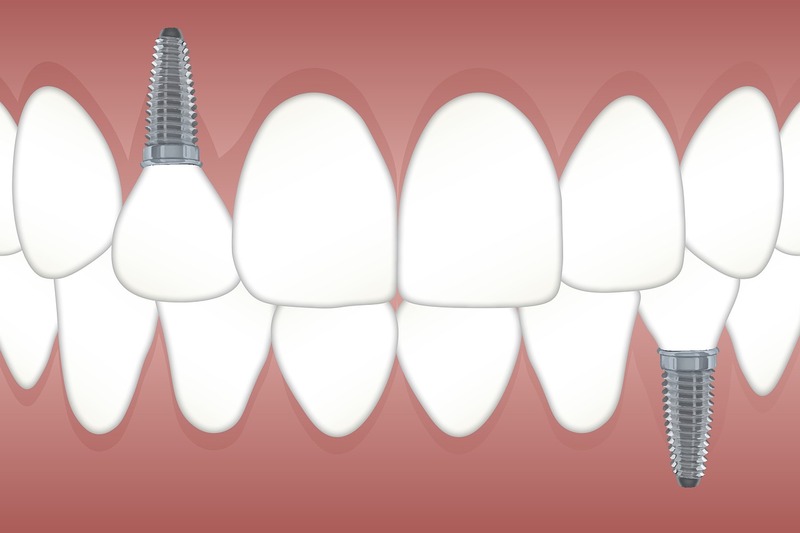 The dental implant has two components, one is the screw made of titanium and the other is a crown. A hole is drilled on the point where the tooth went missing, space is made to place the titanium screw to hold the crown. This is the most crucial part because the slightest mistake can cause damage to the jaw structure and gums. When the dentist has drilled into the correct jaw site, it is bit extended so that the dental implant screw can be placed. Once the screw is placed in the drilled hole a protective cover is fixed on it to allow it to heal and the process of Osseo-integration to start. After almost 6 months the dentist will add abutment and the crown is placed on it.